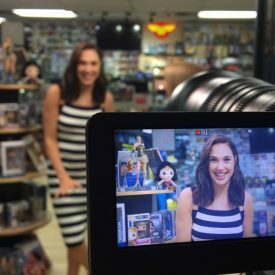 Gal Gadot & Katie Couric Talk Wonder Woman at Midtown Comics! Last week, Midtown Comics was home to Wonder Woman herself! Gal Gadot stopped by to do an interview with Katie Couric for Yahoo! News. It was a sensational event, with the two outstanding women talking about the origins of the character, as well as her significant presence in pop culture, specifically with women around the world. Read more Wonder Woman HERE! To check out the interview itself, click HERE! Wonder Woman is a phenomenal hero, so the two had much to talk about. Katie Couric and Gal Gadot took a stroll throughout the store, browsing through the fine selection of comics available. Their discussion was riveting, talking about how important Wonder Woman is with women around the world, and the many fantastic feminine qualities of the character that make her so unique in both comics and other popular media. After the interview, Gal was kind enough to sign a Funko POP! 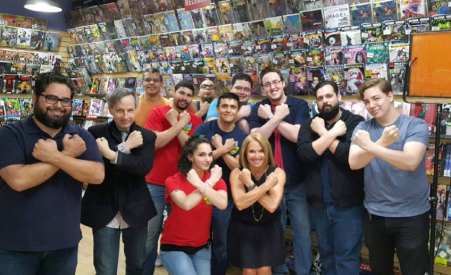 of Wonder Woman for our fan raffle, and Katie Couric posed with the staff for some photos, and talked shop about comics! It was a fantastic time for all involved and an event we’ll never forget! If you can’t get enough of Wonder Woman, be sure to join us this weekend for our massive Wonder Woman Day celebration! We are extremely excited to host the brilliant Brian Azzarello, the creative Cliff Chiang, and the phenomenal Phil Jimenez as a part of the festivities! They’ll be signing a plethora of wonderful books for you, the fans! Additionally, we will have awesome giveaways for attendees, including posters, movies, and more! It is sure to be an amazing day all around and we hope that you will join us at our Midtown Comics Downtown Store (64 Fulton Street). More information for the event can be found HERE! We here at Midtown Comics extend our sincerest thanks to both Gal Gadot and Katie Couric for such a lovely time. It was truly a delight! !